The Briton’s military advantage is in their ranged units. The 20% speed bonus for building ranged units and the range bonus available for archers make the Britons a very good defensive team. Fully upgraded, the Longbowmen can fire farther than almost any unit or building. Cavalry are the main threat of Longbowmen, but the Britons have full infantry technology so can build strong spearmen to provide close combat protection from cavalry for the Longbowmen. The Britons are one of the strongest civilizations just because of their Longbowmen. A large group are nearly impossible to counter because armies will get mowed down due to long range. Teams with good pierce armor like Goths or cavalry units like the Franks have the best shot but a well seasoned player can protect his Longbowmen easily. This team gets very frustrating to play against. The in-game strategy would be to get Longbowmen quickly. Many opponents will rush if they encounter the Britons because of the fear of Longbowmen so you must play a little defense until you build a castle. The English Longbow, or also known as Welsh Longbow, was a medieval weapons used by the Britons. The armor of the knights could not withstand the arrow as armies get decimated from a far distance. 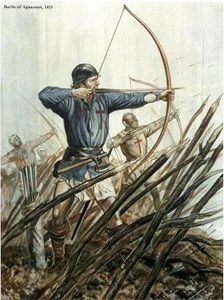 The average English Military Archer could fire 12 to 15 arrows per minute and hit a man-sized target at a minimum of 200 yards. The maximum range was about 400 yards with flight arrows. An archer could not even consider himself skilled at his art if he could not shoot 10 arrows a minute! England was divided among the Vikings, the West Saxons, and a few other English kingdoms for nearly 200 years. The Viking half was called the Danelaw (“under Danish law”). The Vikings collected a large payment, called the Danegeld (“the Dane’s gold”), to be peaceful. The Danes became Christians and gradually became more settled. In time the English turned on the Danes, and in 954 the last Viking king of York was killed. England was united for the first time under an English king from Wessex. In 1066 the Witan (“king’s council”) offered the crown to Harold, son of the Earl of Wessex. Two others claimed the throne: Harald Hardrada (meaning “the hard ruler”), King of Norway, and Duke William of Normandy. The Norwegian landed first, near York, but was defeated by Harold at the battle of Stamford Bridge. Immediately after the victory, Harold force-marched his army south to meet William at Hastings. The battle seesawed back and forth all day, but near dusk Harold was mortally wounded by an arrow in the eye. Over the next two years, William, now “the Conqueror,” solidified his conquest of England. During the remainder of the Middle Ages, the successors of William largely exhausted themselves and their country in a series of confrontations and wars attempting to expand or defend land holdings in France. The Hundred Years War between England and France was an on-and-off conflict that stretched from 1337 to 1453. It was triggered by an English king’s claim to the throne of France, thanks to family intermarriages. The war was also fought over control of the lucrative wool trade and French support for Scotland’s independence. The early part of the war featured a string of improbable, yet complete, English victories, thanks usually to English longbowmen mowing down hordes of ornately armored French knights from long range.